How do you control a harmful invasive species before it damages reef ecosystems? NOAA and its partners have developed and released designs for new lionfish traps that could provide the first realistic means of controlling invasive deep-water lionfish populations and support the development of a lionfish fishery. Fish traps are currently prohibited in Gulf of Mexico and South Atlantic federal waters, and some other areas, without appropriate permits. The two new trap designs, if approved for use in the U.S. or elsewhere, could give fishermen a better way to capture lionfish in deep water, said Steve Gittings, Ph.D., chief scientist for NOAA’s Office of National Marine Sanctuaries and principal designer of the new traps. Known for their distinctive lion-like mane of fins and their venomous spines, Indo-Pacific lionfish have invaded reef ecosystems in the Atlantic Ocean, across the Gulf of Mexico, and throughout the Caribbean over the past several decades. They can be found from the surface to nearly 1,000 feet deep. This invasive species has been spotted in Flower Garden Banks, Gray's Reef, Florida Keys, and Monitor national marine sanctuaries. 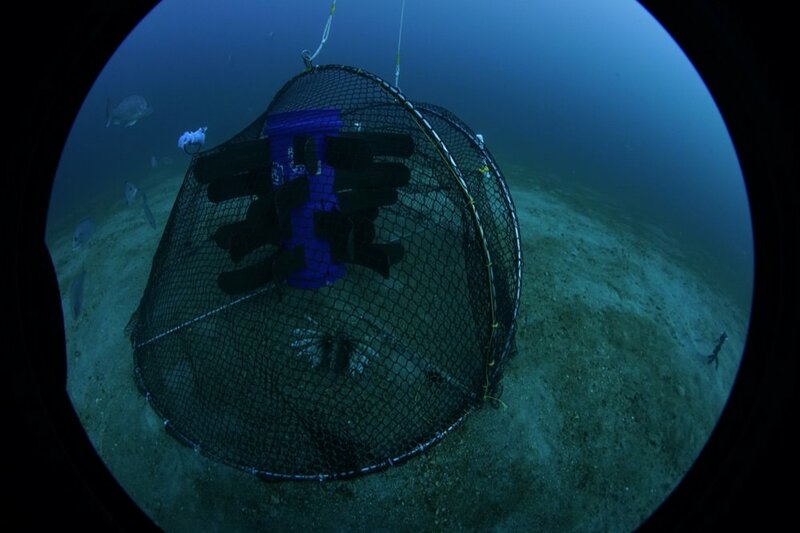 In an effort to control lionfish populations, Gittings has been working with the nonprofit organizations Coast Watch Alliance and Lionfish University, as well as the University of Georgia, to develop and test various designs for lionfish traps and produce a construction guide. Where these devices are approved for use in the U.S. or internationally, fishermen could use them to capture lionfish to meet commercial seafood demands. Eating lionfish -- a white, flaky fish firm in texture -- is one way the public can help combat the spread of this invasive species. Some large grocery chains occasionally sell lionfish. However, despite increasing restaurant and grocer demand, the market for lionfish has not grown to its potential because the supply is inconsistent. Gittings’ goal was to come up with a design that minimizes bycatch, meaning it only catches lionfish. He designed the traps to avoid what’s known as “ghost fishing,” when lost traps continue to harm or catch fish. They also are constructed for easy deployment and retrieval, and for easy transport on fishing boats. The basic concept behind the new traps, which anyone with minimal metalworking skills can build, is that lionfish tend to congregate around structures on the ocean floor. Instead of bait, structures in the center of the traps, called fish aggregation devices, or FADs, lure the fish in. 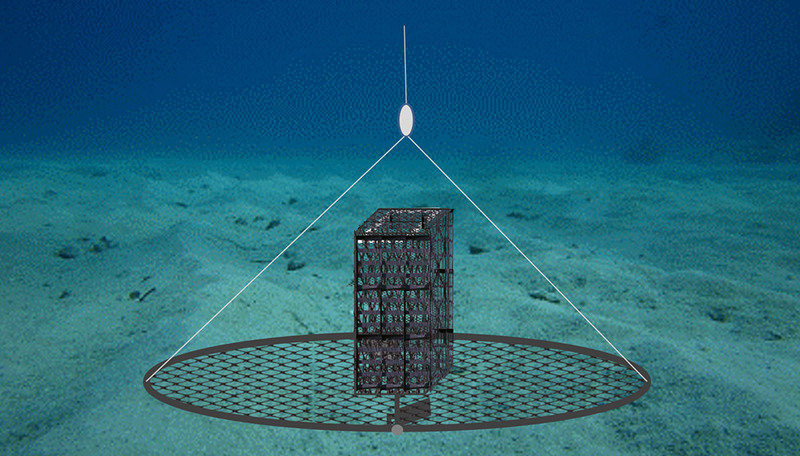 The first prototype trap used net curtains that closed around a cube-shaped PVC frame, trapping the fish inside; the frame of the second-generation trap, called a dome trap, lies flat on the seafloor and closes over the FAD. However constructed, Gittings says every design only captures the fish present around the FAD at the time of retrieval. That way, if lost, the trap will simply lie open, and thus avoid ghost fishing. 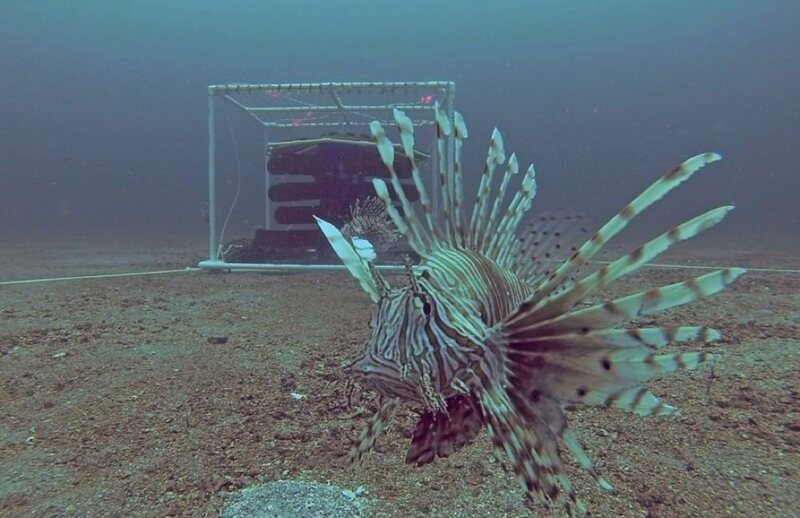 Because other fish species don’t tend to remain as close to home structures as lionfish, these kinds of traps catch virtually nothing but invasive lionfish. Gittings calls the next design he will be testing a “purse trap.” Around a central FAD, two hinged half-hoops, the “jaws,” covered in mesh netting lie open. When hauled up by ropes attached to each jaw, the trap closes like a clam around the FAD, capturing any fish hanging out there. When closed, purse traps resemble change purses -- which means that many can be easily stacked during transport on a fishing boat. In addition, when being hauled up from the ocean floor, the trap travels vertically and very hydrodynamically, so purse traps can be quickly and easily retrieved. During testing off Pensacola, Florida, the traps were placed 30 to 130 feet away from existing artificial reefs in about 110 feet of water. Lionfish typically venture away from the reefs to hunt and feed. When they do, they encounter the traps with FADs. 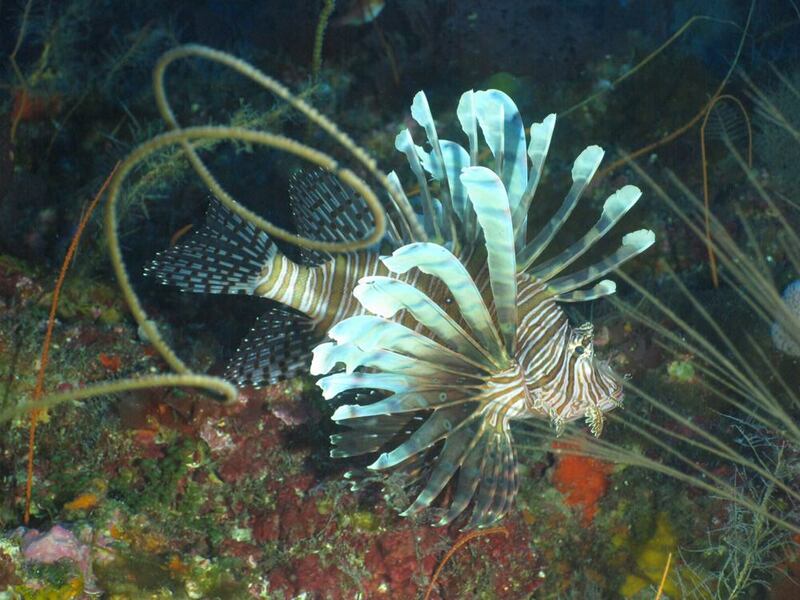 After two days underwater, Gittings' trap designs attracted 35 percent of lionfish from the nearby reefs. Within 18 days, nearly 80 percent of those fish were within the frame of the traps and could be captured. Those findings were encouraging, and point to FAD-based curtain traps as a promising solution to at least part of the problem of invasive lionfish. 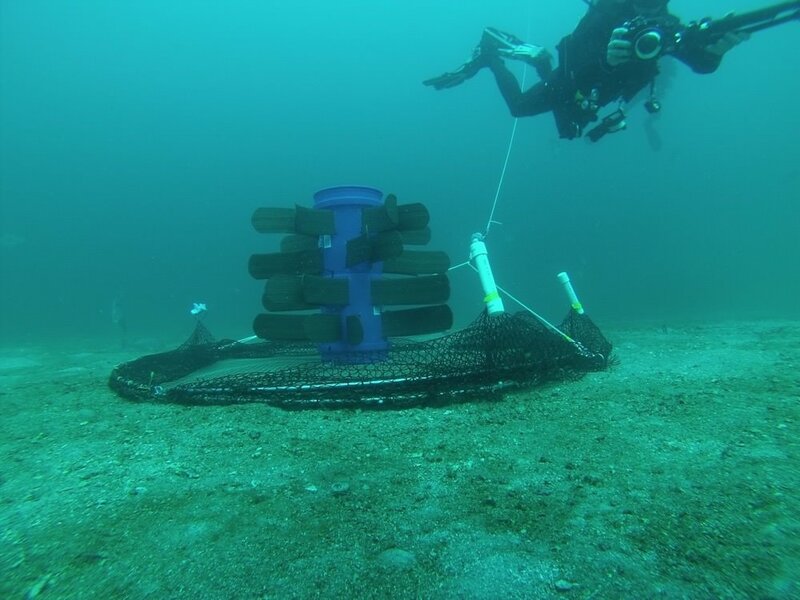 Gittings says both trap designs are now ready for the fishing community in the U.S. and Caribbean to build and test, particularly for use in waters beyond scuba depths. The construction guide provides a starting point for interested parties to further develop and improve the traps. Changes in trap construction materials, shape, size, mesh choice, opening and closing mechanisms, and FADs are among the potential refinements. Because fish traps are prohibited in U.S. federal waters in the Gulf of Mexico and South Atlantic, users must consult with federal and local authorities to obtain the necessary authorizations before testing the devices. 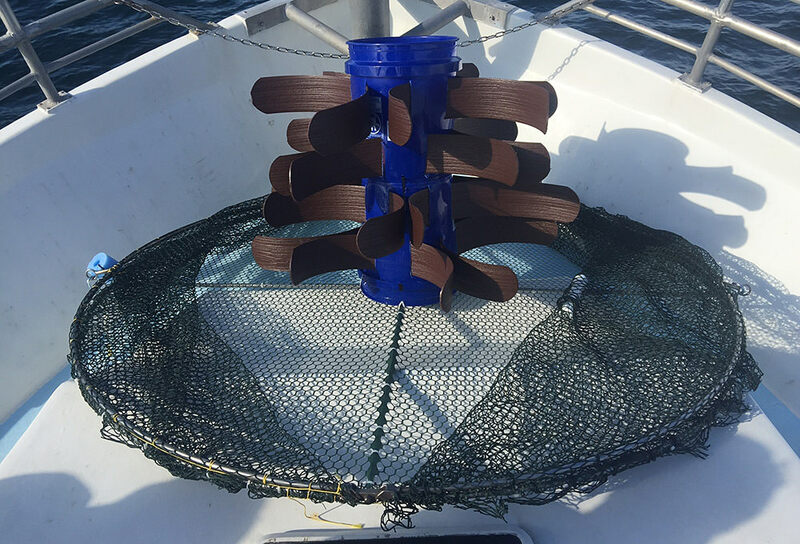 Also, fishing groups or individuals testing these lionfish-specific trap designs are asked to share their experiences on social media and with NOAA so everyone can benefit.